Rural doctors in China; Free cancer screening; New TB vaccine; Do doctors have good cardiac skills? In a sign of the increasing concern about the demise of rural healthcare, China's 1.4 million rural doctors have now been given their own professional organisation. Although it's not quite a trade union, the Chinese Medical Association has established a rural doctors section that will represent the interests of the many village doctors. The move is in response to the ageing of the semi-skilled workforce, most of whom lack medical degrees and have only high school education and a short training course on healthcare provision. According to the CMA, the new Rural Doctors Association "will assist the government to strengthen and promote rural doctor team building for the survival and development of rural medicine and safeguard the legitimate rights and interests of rural doctors." Earlier this year Premier Li Keqiang acknowledged that it was important to retain doctors in rural areas, because their primary care role was "more effective than building a large hospital." 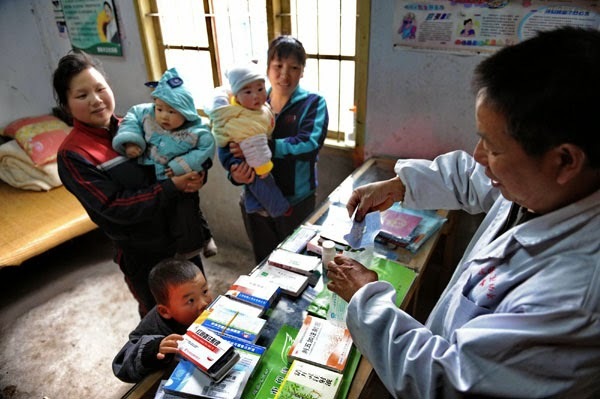 The State Council acknowledged that rural doctors were the cornerstone of primary healthcare for hundreds of millions of rural residents. However, most rural doctors are approaching retirement and younger people do not want to work in remote 'backward' areas in a role that is poorly paid and has few career prospects. Rural doctors by decree are paid the same salary as rural teachers - which is a pittance.Their miniscule pensions are an even greater cause for complaint. Free screening programs for breast cancer and cervical cancer are to be developed nationally in China, according to the National Health and Family Planning Commission. The ministry said 48 million women in rural China had already received cancer screening interventions since 2009, and there were now plans to increase promotion of screening services, co-ordinated by the All-China Women's Federation. Despite studying medicine for seven years, China's junior doctors are unable to manage the basics of dealing with a heart attack, a study shows. A survey of 362 new medical graduates found they had little knowledge about basic cardiac diagnosis and resuscitation. Only about 50% of the doctors were able to identify common normal and abnormal ECG changes such as ventricular fibrillation. Likewise only half knew the basics of which drugs should be given for such conditions. The findings showed that many medical graduates were unprepared to manage the most common cardiac emergencies said researcher Dr Xi Huijun and colleagues from the Changhai Hospital, Shanghai. China is leading the world in developing a new TB vaccine to replace the largely ineffective BCG vaccine against tuberculosis. At a TB vaccine conference held in Shanghai, researchers heard that a vaccine called Vaccae developed by an Anhui pharmaceutical company is in Phase 3 trials, whereas other candidate vaccines from other countries are only in the preliminary stages. Researchers said the vaccine would probably of most use in the elderly, who are expected to account for more than half of tuberculosis cases in the future.